I remember reading about controlling Korg effects by Xone's knobs even before I bought both of them, but this is not the thing I'm after, as Korg's touch-pad actually seems to be more convenient way to control it's effects anyway. 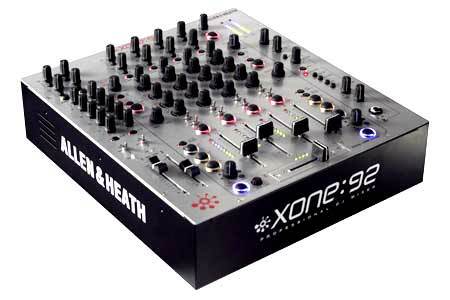 Xone mixer features three controls for it's MIDI clock generator: Tap button, Start/Stop button and speed adjustment knob. Given that my tracks range somewhere from 118 to 142 bpm, before starting the performance I'd have to place the adjustment knob into middle position, then manually tap in 130 bpm. Pressing Start/Stop button would then kick off playing and adjustment knob would have the right range for changing clock's speed. I found that Korg Kaoss Pad 2 does not by default react to incoming MIDI clock. After digging through the operation manual it turned out that enabling this requires to enter setup mode by pressing and holding Record + TAP buttons, then pressing Sample 1, then touching anywhere on touch-pad to apply and exit. What's worse, it does not remember this change, so after turning the device off and on again you have to repeat the steps. Not a big problem of course, but I'll have to remember this trick combination for the rest of my life :) Now, when this thingy is enabled, the effect processor does indeed respond to the incoming clock data and some of it's effects (delays mostly) sound more applicable then they do off-sync. Now, next step is to plug in MIDI cable into the sound card and see what happens. Ableton Live is happily controlled by external clock, if you enable right buttons in the MIDI settings and tick "external MIDI clock" option. Next challenge is to control both - Korg and computer at the same time. There are two ways to connect MIDI devices - star and chain. Star connection requires special MIDI splitter, which I don't have, so I had to stick with the chain setup. It turned out that Korg does not pass the incoming MIDI clock on to the next device, period. Computer's sound card on other hand can be persuaded to do so by enabling it in Ableton Live's settings. So, my setup looks like this, I've got one MIDI cable connected from the mixer to the sound card's MIDI In and other one from it's MIDI Out to the effect processor's in. Success! While normally I'd bump most of my Reason's tracks to Live's clips, essential part of my setup was to play the melodic parts from Reason real-time. And for real techno tracks, which are repetitive and don't have the melodic parts, I'd leave some of the lead synthesizers to be played by Reason, so their parameters could be controlled manually and performance would sound a little bit different every time. Unfortunately, when using external MIDI clock, everything goes to hell. Live and Reason just won't keep synchronized. They only do when using Live's clock and enabling the "Delay compensation" option (which is inaccessible when external clock is used). So, my current idea is to dismiss the Xone's generated clock and hook up everything including Korg to Live. Live's tempo however can be controlled by any MIDI remote controller. Again, after some small research it turned out that I need a screw driver :) If I open up my mixer and switch a jumper, Xone's tempo adjustment knob will become a data controller and I'll be able to use it for controlling Live's clock speed. This is an awesome post. You always did have great articles about gadgets and topics I've never heard of until now. Great job on this one by the way.